Washington: You would have killed those two guys without even blinking a few yearsback. Your losing your edge. Wolff: I am NOT losing my edge. I'm just trying to do things a little smarter! 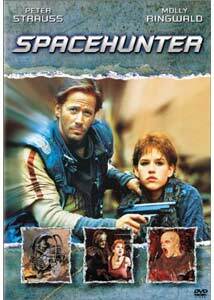 Spacehunter: Adventures In The Forbidden Zone is pulp-space-fiction at its best; not masterful or brilliant, but clever enough to be entertaining and escapist. In fact,Spacehunter has a distinctly Heavy Metal feel to it and, not surprisingly, was written and produced by the team of Daniel Goldberg, Len Blum, and Ivan Reitmanwho had, only 2 years previous, worked on the film version of Heavy Metal together. This is quite appropriate considering it feels so much like a serialized comic book sprungto life. More interesting is the involvement of director Lamont Johnson, a man with animpressive résumé of film and television projects dating back into the 1950s. The end result is something playful, but just below its true potential. Peter Strauss stars as Wolff, an intergalactic jack-of-all-trades with a dismal reputation. When an interstellar cruise ship runs into disaster, he picks up the emergency call, and thejob could earn him enough to retire on. As it turns out, only 3 outer-space supermodelssurvived the accident and they've wound up marooned on a horrible, quarantined planet,filled all sorts of nasty folks. Wolff decides to move in and make a daring rescue for thecash, but finds things considerably more complicated because the planet iscontrolled by a power-mad, cybernetic dictator calling himself 'Overdog' (MichaelIronside, almost unidentifiable in elaborate make-up). Since Overdog requires the life-force of healthy beings to survive, he's taken a fancy to these three Earth girls and kidnapsthem. Wolff pursues but, knowing he's in unfamiliar territory, is forced to team up with alocal scavenger girl, Nikki (Molly Ringwald), to locate Overdog's hideout in the ForbiddenZone. As he progresses towards the Zone, Wolff encounters a variety of friends, foes, andstrange creatures he's not sure what to make of. Spending little time on anything otherthan the fun parts, Spacehunter moves along quite nicely and provides asimplistic, but very well done adventure. Since most of the screen time is given to Straussand Ringwald, luckily they fill their parts well, especially Ringwald who manages to speakfluently in some great, made-up slang designed to offer some insight into the culture of thewasted planet. The effects, sets, and costumes aren't as tight as they could have been, butget the job done without looking too silly. Ernie Hudson shows up in a small, supportingrole as an old partner of Wolff's, providing some additional comic relief, though themovies does not take itself too seriously anyway. My main gripe with Spacehunter is that very little time is spent on the villains inthe story. Overdog and his drug-expert minion, The Chemist, are never really much morethan brief horrors that never get an opportunity to be truly evil. Overdog's appearancetowards the end is much too brief and the climax of the story isn't really as exciting orambitious as it should be. Too much time is spent on the journey there rather thanthe Forbidden Zone itself. In general, this isn't a big problem, because of thenonchalant attitude of the script, but a longer film might have proved more impressive. These details aside, Spacehunter delivers what it promises: a solid sci-fi story with theattitude of a comic book, yet without all the gratuitous violence and nastiness of similarprojects. Image Transfer Review: Although the case incorrectly states a widescreen presentation of 2:35:1, it is in fact,1:85:1. Some minor controversy has emerged because of this, mainly becauseSpacehunter's official aspect ratio is 2:35:1. However, from what I can tell, itseems to be a complex issue: the film was originally shot in 3-D, in a style that gets cropped into 2:35:1 for proper 3D projection, when in reality, the source negatives are essentially 1:85:1. The film is composed for 2:35:1 exhibition, but the 1:85:1 presentation is, basically, open-matte. That said, I seriously do not think any image loss has occurred and that 1:85:1 is indeed the proper aspect ratio for non-3D, home presentation. The image feels completely solid and well composed at all times, with nothing going off screen that should be on-screen. In fact, some sequences have the camera following characters rather tightly, and they're always kept right within the limitations of the current frame. In fact, whereas the 1:33:1 version is awkward and has many visuals oddly positioned, the 1:85:1 has none of these obvious flaws. Sadly, thesource print is in very bad condition. The film looks better than I have ever seen it, but allof the exact same problems, with extremely heavy grain that plagued past VHS editions, arestill here. The moments of fading and/or heavy negative marks before reel changes arethere as well. Black level also changes from scene to scene, being fine some times, thenwashed out and then gray other times. While the transfer itself never allows this to become aproblem (there are no compression artifacts and very, very little pixel movement orshimmering), it still is a hazy, overly-soft image. I've noticed this with virtually every filmmade in 3D during the 1980s, and I wonder if the process has something to do with it. Considering the movie's entire palette is based mostly on red, this disc could have easilybeen a complete disaster in terms of bleeding but it is salvaged enough that fans really won't care because it's identical to the past versions. It is in desperate need of a make-over, though, if it is to survive into the future. The second side of the disc contains a pan-and-scan, 1:33:1 presentation that, in many ways, is pointless. The flaws on the negative are magnified even more and the tight composition is ruined with many things being off-screen just enough to cause confusion. Audio Transfer Review: The English audio is a 4.0 discreet mix while the French is standard 2.0 Surround. I'mcurious as to what prompted the 4.0 mix since it's basically uneventful. The front threechannels take 99% of the action, with a few, very minor surround effects going to therears. Everything is mixed well; dialogue is clear and loud while sound effects and musicalscore get some work out into stereo effects. This is all curiously ineffective, though, asthe soundtrack lacks the enthusiasm it should have for a movie with plenty of explosions,laser beams, and other assorted stuff. There's minimal bass, making some scenessurprisingly flat. Unquestionably, this sounds much better than previous mono VHS tapesof Spacehunter, but it still seems to be somewhat under potential. Extras Review: Disappointingly, there are no supplements other than trailers for other CTHV sci-fi flicks. I thought maybe there would be a chance for a commentary of some sort, or even themaking-of documentary that aired on television right around the time of the film's originalrelease. Another disappointment is the total evisceration of the original artwork. Not abit of the original promotional campaign (including the great painting used as the originalposter) is present, and the case is entirely new, from the ground up. Far below my hopes, Spacehunter on DVD is nice to have as a fan, butunquestionably needs a re-release as a special edition later on down the road. It's a worthyrental for those who like old-fashioned, gritty, sci-fi adventures in the pulp fiction vein.